The first comprehensive Review of Equalities, Diversity and Inclusion within Scotland’s Screen Sector has been published today, Tuesday 31 January, 2017 by Creative Scotland. Equality Matters: A Review of Equalities, Diversity and Inclusion in Scotland’s Screen Sector draws on evidence gathered from individuals and organisations working in film and TV in Scotland set against a backdrop of national and international research and policy. The Review highlights evidence of the numerous and complex barriers to access, progression and representation both on and off-screen which exist at many levels in Scotland’s Screen Sector including economic limitations, geography and gender. The Review also incorporates a series of recommendations for positive and collaborative action to support a more inclusive and representative Screen Sector in Scotland. One of the main conclusions to emerge is that for change to be significant and long lasting, there needs to be a commitment to EDI across all that we, as a sector, do: from the tracking and monitoring of EDI data to the provision of educational programmes, the accessibility and visibility of entry points for new and emerging talent, career progression for practitioners, on-screen representation and better ways to connect with and reflect the diversity of our audiences. in partnership with the Screen EDI Working Group, Creative Scotland will develop a Screen EDI Framework enabling us to set EDI targets and monitor representation on and off-screen across our Screen Funding Routes. A full list of recommendations can be found on P.56 of the Review. Natalie Usher, Director of Screen at Creative Scotland said: “True representation both on and off-screen is vital for the sustainability of the Scottish and UK Screen Sector. Not only is it ethically right, but also it is clear that diversity of thought feeds innovation and creativity and that audiences are engaged by a wide range of stories, perspectives and experiences. “We said in our 2014-17 Strategy, Creative Scotland: On Screen that we are committed to developing a skilled and diverse workforce, creating opportunities for under-represented groups by challenging existing approaches to working practices in the Screen Sector. “Our ambition is to encourage talent development programmes which address gaps in current provision, in particular in the context of equalities and diversity, to champion filmmakers to reflect the diversity of Scottish voices, and to urge exhibitors to broaden cinema access and programming in Scotland for as wide and diverse an audience as possible. “In order for change to be significant and long-lasting, there needs to be a commitment to EDI across all that we, as a Sector, do: from the tracking and monitoring of EDI data to the provision of educational programmes, the accessibility and visibility of entry points for new and emerging talent, career progression for practitioners, on-screen representation and better ways to connect with and reflect the diversity of our audiences. Throughout the development of the Review, Creative Scotland has been continuing to refresh its own processes. In the first instance, we are actively working with the British Film Institute (BFI) and other agencies across the UK and internationally to ensure that there is greater commitment to gender parity. We have revised our equalities monitoring processes so that we are now able to track both applications and subsequent awards made to female and male practitioners as well as all other protected characteristics. We have also updated our Screen Funding criteria so that practitioners can include access costs (including childcare) as a budget line in talent or professional development opportunities where they are under-represented and these costs are a barrier to their attendance. The Review also reflects UK and international literature on under-representation in the Screen Sector in the context of gender, ethnicity, disability, sexual orientation and socio-economic background and details EDI policy initiatives currently in development and underway with Screen Agencies and broadcasters. This information is summarised in Annex 1. (P.59). It is now widely recognised that the lack of diversity on screen and behind the scenes is a problem that needs to be addressed. With support from Creative Scotland’s Screen Skills Fund, FIND Scotland recently recruited 12 young, talented and ambitious individuals from under-represented groups and supported them to pursue a career in the Scottish screen industries through an intensive programme of training, industry placements, career guidance, and short film commissioning that ran from January to December 2016. The programme aimed to find pathways into employment and production for participants. Ali Bailey from Directors UK will deliver a keynote speech and there will be screenings of the short films commissioned as part of the FIND Scotland programme. This event will close with a discussion exploring a new framework for recruitment of people from diverse backgrounds in to the screen sector in Scotland. FIND Scotland is a partnership project delivered by GMAC Film, Screen Education Edinburgh and Station House Media Unit and is supported by Creative Scotland through the Screen Sector Skills Fund. Women in Film & TV (WFTV)’s discussion Women & Film Funding: Where are the women in film? WFTV CEO Kate Kinninmont will chair a panel of local, national and international film fund representatives exploring practical measures to address the under-representation of women in film. With a flurry of research published in 2016 charting the continued under-representation of women both on and off-screen at national and international level, and coinciding with the publication of Creative Scotland’s Equality Matters: A Review of EDI in Scotland’s Screen Sector, delegates are invited to join decision makers Natalie Usher (Creative Scotland), Lizzie Francke (BFI), Ian Davies (Boudica), Claudia Yusef (Scottish Film Talent Network) and Yaba Holst (Swedish Film Institute) to discuss methods to address inequalities of opportunity, participation and progression for women in film. 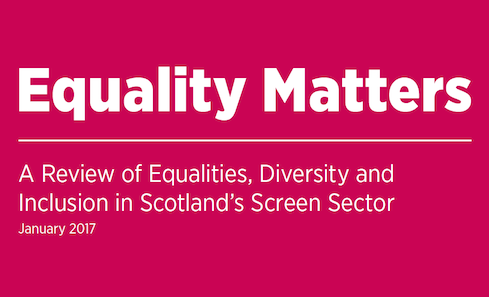 View Creative Scotland’s Review of EDI in Scotland’s Screen Sector: Equality Matters. In the context of Equalities, Diversity and Inclusion (EDI), as a public body Creative Scotland has a ‘general duty’ to eliminate unlawful discrimination, harassment and victimisation, and advance equality of opportunity and foster good relations between protected characteristics. EDI is a connecting theme in Creative Scotland’s 10 Year Plan Unlocking Potential, Embracing Ambition, through which we aim to put EDI at the heart of all our activity enabling people from different backgrounds, from diverse communities and of all ages to access increased opportunity through arts and culture.